Virat Kohli slammed his 25th hundred in just his 170th one day international and 162nd innings, becoming the quickest to get there, breaking Sachin Tendulkar's record. The Master Blaster took 234 innings to reach the milestone. Kohli is now fourth on the list of batsmen with most hundreds in one day cricket. Sri Lankan batting legend Kumar Sangakkara retired with 25 hundreds from 404 ODIs. 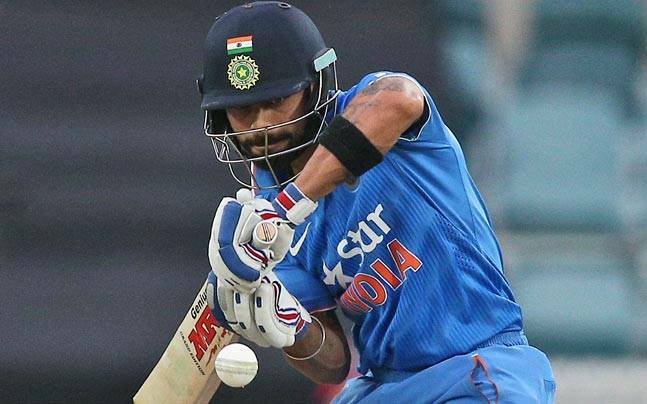 This was Kohli's second successive hundred after scores of 91 in Perth and 59 in Melbourne. The 27-year-old smashed 117 at the Melbourne Cricket Ground on Sunday. [the_ad id="3627"] Chasing an improbable 349, Kohli walked in after the in-form Rohit Sharma departed for a 25-ball 41. He got off the mark with a boundary when he punished a half-volley from James Faulkner and did not look back since.